1. In light of the spread of the Islamic State in Syria and Iraq, has this affected your stance regarding Israeli territorial concessions in the West Bank? 2. Do you support or oppose the establishment of a Palestinian state on the 1967 lines? 3. Do you support or oppose the establishment of a Palestinian state if it means an Israeli withdrawal from the Jordan Valley? 4. Would you agree to the replacement of the IDF with international forces in the Jordan Valley? 5. Do you support or oppose the establishment of a Palestinian state if it means the division of Jerusalem? Ok, so its pretty clear from the poll that a large majority of Jewish Israelis are disenchanted with the peace process and are against making large concessions to the Palestinians. AND THIS IS NEWS TO SOMEBODY??? Have a look at the results of question 2-5 and you may notice they are almost identical. The reason why is pretty clear to me. THEY ESSENTIALLY ASKED THE SAME QUESTION 4 TIMES. Isn’t it pretty obvious that if you have already suggested that you are against a State on the 1967 lines that you would also be against withdrawal from the Jordan Valley? And International forces in the Jordan Valley? And the division of Jerusalem? Its like asking someone “do you like eating bull’s testicles”? and then following up by asking “how about sheep’s testicles”? “No? How about goat’s testicles”? “Camel”? JCPA Poll: Solid Majority of Israeli Jews Oppose Palestinian State. No, no, no and no. I am very sorry. Now it may be in fact be the case that a “Solid Majority of Israeli Jews Oppose a Palestinian State”, but the evidence is completely absent from this article. Nowhere does this poll’s results give us any answer to the question “Do you support or oppose a Palestinian State, even an itty bitty one that keeps Jerusalem undivided, does not include major settlement blocs along the Green Line, does not include the Jordan Valley and does not provide for the Palestinian right of return”? We don’t know the answer because the question was never asked, or at least was not published in the JCPA’s article. And its a shame because it would have been an excellent question to which I would love to hear the answer. But you cannot draw a conclusion like that without making a huge assumption. And yet that headline screams out to the world that this in fact is the conclusion of this inadequate poll. And if it turns out to be incorrect (which I suspect it is), it is dangerous and harmful to the Pro-Israel cause. 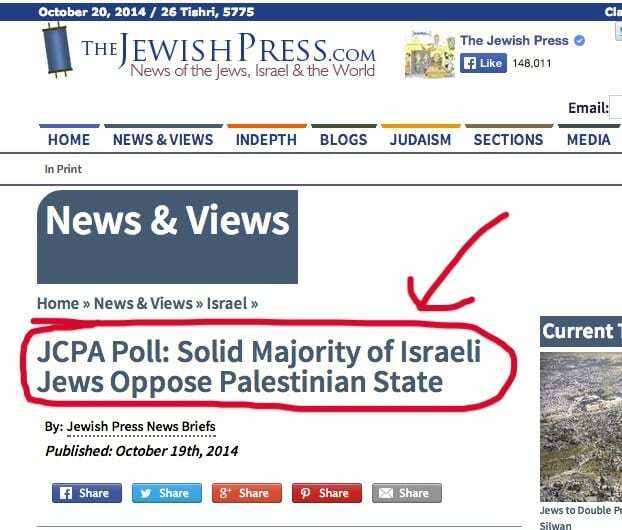 The JCPA Director of Publications, Lenny Ben David told Tazpit News Agency that the poll must also be looked at in the context during the time in which it was taken. “Israelis who were surveyed for the poll did so following the past summer war, the murder of three Israeli teens and Palestinian President Mahmoud Abbas’s verbal attacks on the state,” he told Tazpit. “On a general level, the majority of Israeli Jews are opposed to the return of the 1967 lines. But when the concept of a Palestinian state also involves Palestinian concessions, like right of return and an end to terror, then Israeli public perception changes,” he told Tazpit. But the original piece with the misleading headline is still up as of this post.